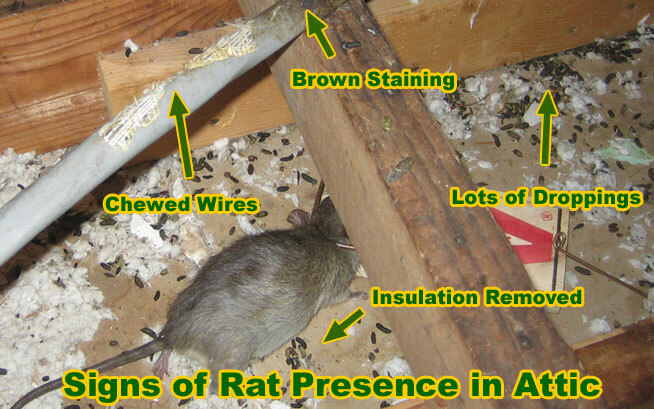 This website is obviously about rats in attics of homes, but they can get into all sorts of buildings. I've removed rats from dental offices, food warehouses, furniture stores, fast food chains, fancy restaurants, an orange juice factory, and so on. Rats need food, water, and shelter. Any building can provide shelter, and if there are a lot of small, enclosed spaces that a rat can fit into, all the better. Oh, the best of all worlds! Shelter AND food! Yes, there's a reason why rats are common in restaurants and kitchens throughout the world. These crafty rodents will live wherever they can find food and shelter, and restaurants fit the bill. There's food, oh yes, LOTS of food! It's often just thrown out. It doesn't matter if your restaurant is clean, and your kitchen spotless. There's still going to be shelter and food there, so rats will live in a diner or fast food joint or fancy eatery, SO LONG AS THERE ARE OPENINGS THAT LEAD INTO THE BUILDING. It all comes down to the openings. You can have the nastiest, dirtiest restaurant in the world, but if there are no openings for rats to get inside the building, you won't have rats. And if you have the neatest, cleanest, most sanitary kitchen in the world, but there are ways for rats to get into the building - open vents, ducts, etc, well then, you're going to have rats inside. I've removed rats from warehouses several times, including from some huge food warehouses of large companies that I won't list here. No big deal, it's just a fact of the matter in the world we live in. I think there's like a certain allowable percentage of rat feces in the food we eat anyway. Still, you want to limit rat damage and disease as much as possible, so as usual, it all comes down to openings into the building. The problem with warehouses is that they have large cargo bay doors, and there is practically no way to properly seal some of these doors. I guess maybe they make rat-proof ones, but the warehouses I went to were lost causes - and many have to keep doors open during night-time hours. In a case such as this, it's perhaps best just to keep rat populations down as much as possible by limiting food sources, and leaving out tamper-proof rat-trapping stations. I still say that poison is a very bad idea. Same explanation as the warehouse above. A large industrial building can have many entry points, and some of them are impractical to seal shut. In some types of factories, impossible. I did a lot of rat removal work at a citrus processing plant in Florida, and I really didn't see any way of sealing up those huge buildings. I guess, with a lot of time and effort it could have been done, but they never hired me to do so. The just called me out whenever a dead rat (or two) was really stinking up an area. That's what they get for using poison. I tried to offer a better solution, but they had some pest control contract that they wanted to keep, so... whatever. 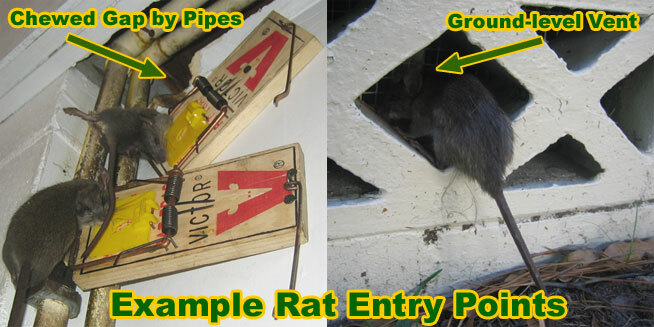 Keep an eye out for rat in the toilet as well, which can sometimes happen when they come through the plumbing lines. Although I wrote this site with rats in mind, such as the Roof Rat and Norway Rat, the same principles apply to other rodents, such as the house mouse. Mice behave very similarly to rats, they're just smaller. Email me if you have any questions about how to remove a mouse in the kitchen or restaurant, mice in buidlings, mice in restaurants, rodents in commercial buildings, and so on.